From seven in the morning to about four in the afternoon all we hear is the thump thump thump of bulldozers…. six days a week. Oh, and the dust too. Of course things could be worse, but the steady beat of the steel bulldozer treads has been relentless all summer and I hope it’s finished soon. Also I hope it’s not replaced by something more annoying! The above picture is of the dried up vegetable beds with construction in the back, and as you might be able to see I’ve given up on the garden and it’s slowly dying without water. Earlier in the week when it was cooler I was inspired and planted out a small bed of lettuce transplants, dutifully watering them in, but today as the temperatures climbed to 87F (30C) with bone dry soil, I’ve given up in disgust. 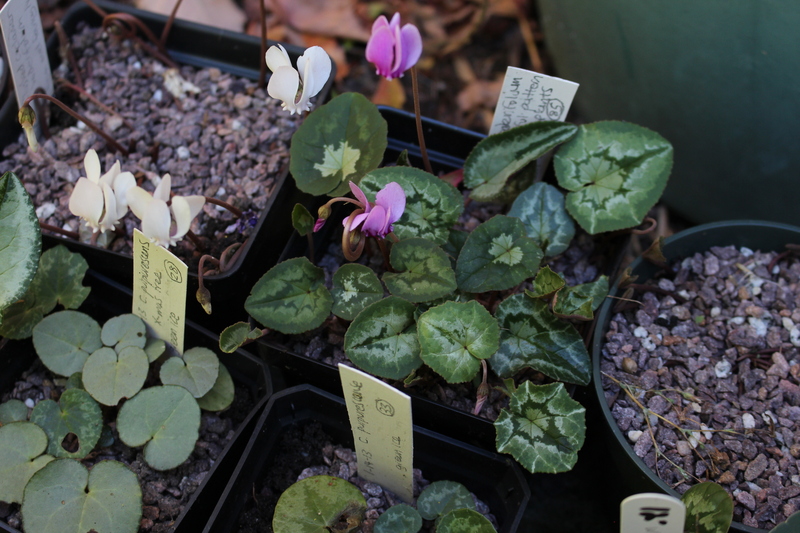 When all else fails I take a look at my cyclamen hederifolium seedlings. How can you stay grumpy with leaves like this sprouting up? The fall rains will come some day and I’ll complain about the damp I’m sure, but right now I could go for a nice soaking. I want the rain so I can get transplanting, there’s just no joy in it when the soil is so dry you need a pickaxe. Fortunately I at least got the compost pile turned, and although it’s also a dry fungal mess there was some good stuff at the bottom. In another week or two my new bulbs will appreciate that! This entry was posted in cyclamen, fall, garden, Uncategorized and tagged cyclamen hederifolium, drought, fall. ← Why wait for spring? Wishing you silence and raindrops. I would settle for a few raindrops… They claim it will rain tomorrow, I’m not convinced. Oh my…what’s worse…the noise or drought? With your wonderful homemade compost I’d think it would be able to hold water quite well if you can get water to the garden, even via a seeping weeper hose under a bed of mulch currently or next year planted underground. Just the smallest amount of water should salvage much of your garden. Another tip for drought conditions and during water rationing is to place ice cubes right at the base of each plant to keep roots cool and hydrated. Hope this helps! Thanks for the suggestions! I do have a drip system for my container plantings and after the last two summers I’m thinking about extending it to a few select garden plantings. I’ve never had much luck with the weeper hoses, the ones I’ve tried have been too uneven in where they weep…. Sounds like you could grow to like autumn now Frank! Is it always so hot this late in the year? Hope you get some gentle rains so the ground can soak it up nicely, followed by a downpour for good measure! I have never had such soft damp (wet!) ground for my autumn planting before and am very appreciative. Any idea what is going to be built on that ground beyond your garden? For a few days I did feel a little like I could tolerate autumn…. That’s a start, right? Word is the lot will be graded for additional truck parking. My fingers are crossed for no massive lighting system and not much truck moving at night! For 2 yrs we had building work going on next door so I know what you’re going through. We didn’t sit out for a meal during that time, it was so noisy every day, even on a Sunday as one of the houses was being privately built. At least we now have silence again, I hope you do too very soon. Ah yes, I remember your new neighbors construction. I hope this thing becomes further and further from my mind as the building tapers off and the screening vegetation grows up. I was online again looking for evergreen transplants! I’ve pretty much let my vegetable garden go at this point too. I keep forgetting that I need to water the spinach seeds I planted about four weeks ago, so they’ve done nothing. Now I am hauling the hose around to keep all the newly planted perennials moist, but that’s getting tiresome at this point! Kind of happy to say we did not hit 87 up here yesterday, but topped out around 78, How nice to get the best weather of the summer during the first week of fall! I would imagine the construction noise and dust are pretty tiresome at this point. I think I’m numb to the dust, it’s been years now! The hose dragging is becoming old here too. Hopefully by the end of the week there will be some relief since I’m afraid I missed a few of the transplants here and there and only remember at night when I’m laying in bed. Constant noise is horrible, I hope it is finished soon and that as you say nothing worse follows on. During summer (even to a slightly lesser extent this summer) the farmers here water the maize crop (food for cows); they use diesel powered generators that sometimes run for 24 hours a day, not thankfully always in the fields closest to us but enough for me to appreciate the silence of late autumn and winter! I guess we are used to a lot of the noise already, there are two highways nearby, train tracks, and an airport, all of which make us immune to most of the noise…. Still I would much rather enjoy peace and quiet day in and day out. I’m sometimes shocked by the silence when I leave our valley, if I could I wouldn’t mind making the move permanent! Noise is horrible, silence is golden as they say! I’m so sorry for the noise and the dust and the disruption of your view. It’s terribly sad. I know what you mean about getting accustomed to the noise but then when you actually experience quiet it’s hard to go back, no? Reminds me of the bulldozers behind my parents’ townhouse before we sold it; I think the project was abandoned or put on hold, after they’d flattened everything. Hope things get better all around soon. We have been having unseasonably warm, dry weather here too but I can’ t be bothered to keep up with the watering. I hope you get some rain soon and also peace and quiet. 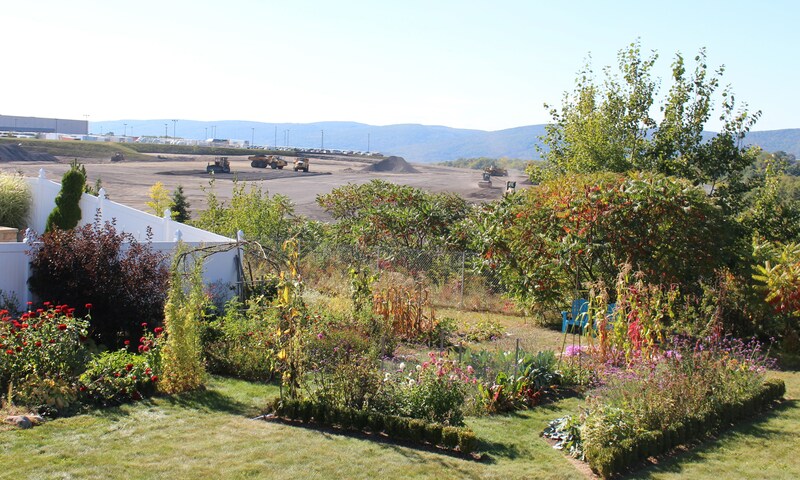 I like to feel that I am in my own little world in my garden; difficult for you with bulldozers so close by. Our area is already completely built up, so there isn’t much construction noise. My least favorite noise is that of the leaf blowers. We just got rain today, maybe it will travel on to your neighborhood. I am commenting on this again because I’ve found some of my comments to other WordPress blogs are going to the owners’ spam folders, and I want to see if that’s happening across the board or just for specific ones. Sure hope we really get some rain this weekend! ….it was in my spam folder, yet a comment promoting bathroom cabinets in Orlando came through! Hopefully this gets fixed.